Chex Quest was originally created as promotional material for the Chex brand cereal. Shortly after it’s release Chex cereal sales nearly tripled. Children were indoctrinated with the idea that Chex was now cool. The promotion was seen as a smashing success and Chex Quest 2 was released shortly after . Then suddenly it was all gone. Over the next decade small communities would rise, all singular in their love for Chex Quest. Mods were made, forums thrived, multiplayer was added, and a “third” game was made. That “third” game turned out to be just a hoax with multiple levels being stolen from other mods. Then, like a light in the darkness Charles Jacobi stepped forward. He and another member of the original Chex Quest team, Scott Holman, started working on a canonical Chex Quest 3. The project was released in 2008 with updated versions Chex Quest 1 and 2. You can get the whole thing here. Charles was nice enough to take the time to answer some of my questions about the Chex Quest series. What exactly was your job on Chex Quest and what did that job entail? I was the art director/lead artist, but also the level designer. I spent most of my time making sprites and textures using Photoshop or making concept drawings to pass along to other team members. Early in the project, I drew up the original level layouts which got handed to somebody else to build in Doombuilder. Chex Quest was pitched as a non violent game for children. Why choose what, at the time, was considered one of the most violent games, DOOM, to modify into a children’s game? When this project was signed by Digital Cafe, we had a very limited amount of time and money to make it. Our best chance of success was to license some other game and do a total conversion rather than attempt to build a game from scratch. Since Doom was already being made obsolete at that time by Quake’s technology, id Software agreed to a very reasonable licensing arrangement to use the Doom engine. Ralston (the client) was really skeptical about using Doom, but were willing to let us do a demonstration of a non-violent conversion. How did the idea of replacing Death with being Slimed and Shooting with Transporting arise? Were there other ideas as to how to make shooting a non violent event? We brainstormed a number of things to keep the product rated E. Teleporting the enemies away was one of the first ideas, along with an idea of shooting healthy foods at the flemoids to neutralize them. The food fighting thing didn’t go over well with the client, so we settled on the teleport concept. 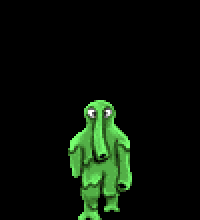 The Flemoids have a very distinct sound. 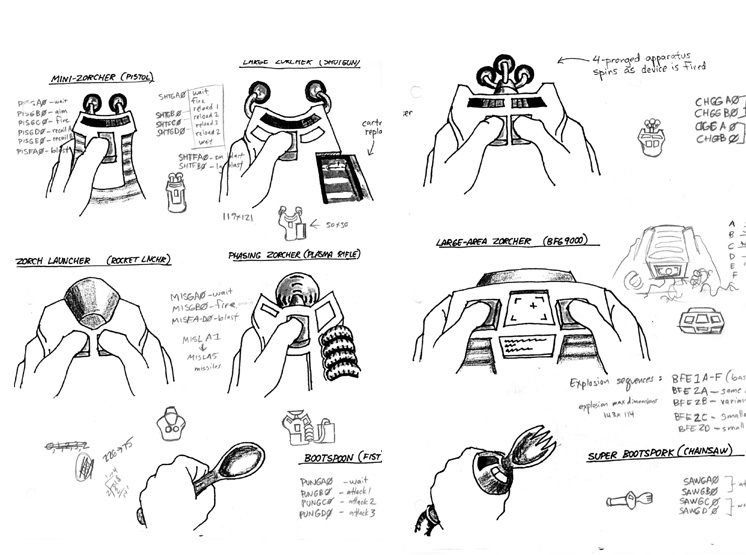 What was the inspiration for their distinctive calls? That was Dean Hyers (Digital Cafe creative director) and Andrew Benson (audio designer) just sitting in the sound booth and acting like little kids. I don’t know if there was any specific inspiration. Was the original plan to make only five levels per game or did the team have grander ideas in mind? The original deal with Ralston was just for Chex Quest, a pack-in product for a cereal box with a small budget and limited scope. We never considered more than five levels. None of us expected that there would be any sort of longevity to the Chex Quest brand. Promotion material like Chex Quest is not likely to get a sequel, yet Chex Quest 2 was made. What is the story behind that? Ralston was shocked at the jump in sales they saw when Chex Quest got packed in. Toy promotions in cereal boxes rarely saw the kind of jump that Chex Quest created. They wanted to quickly capture the enthusiasm generated by the game and get people to go to ChexQuest.com, so they had us knock out five more levels quickly. Wikipedia claims that advertisements were available for the eventual Chex Quest 3 game back in 1997, why was the series then canceled after Chex Quest 2? How far along in development was Chex Quest 3 at the time? The Wikipedia information is false. Some modders built a Chex Quest 3 out of bits and pieces of other Doom mods and claimed they had found an unfinished CQ3 beta. The truth is Digital Cafe never did any work on anything related to the series after the additional levels of Chex Quest 2. Over a decade later, how much is different from the original design is Chex Quest 3? The biggest differences are to be found in Chex Quest 2. Those additional five levels were very rushed and it shows. 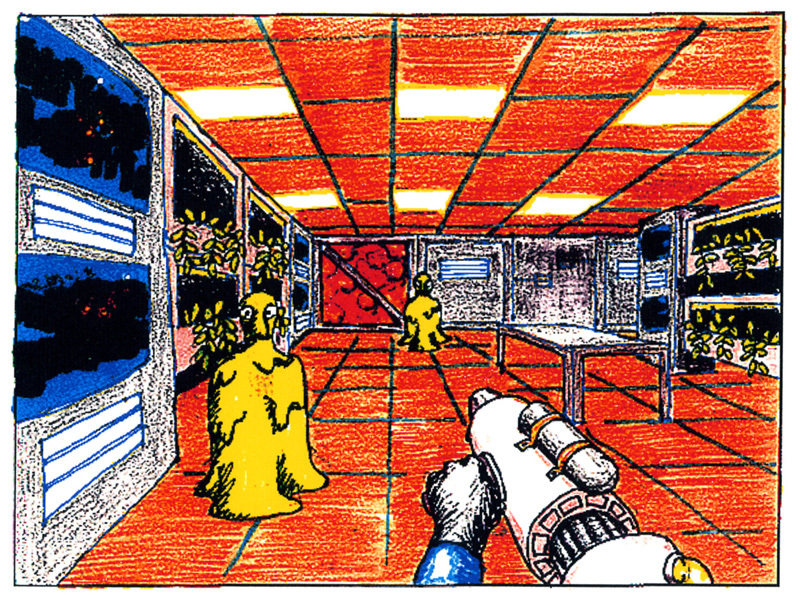 There were plenty of walls with boring grey textures and level progressions that weren’t all that well thought out. I did a full overhaul of one level in CQ2 and significant revisions to some of the others. CQ1 didn’t change much apart from fixing bugs. 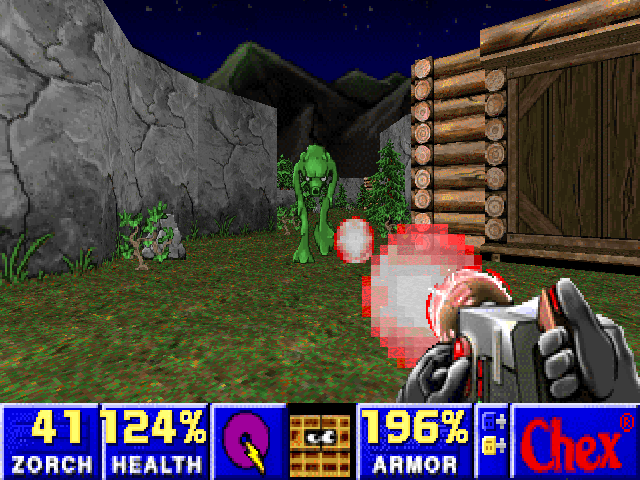 By the third game the Chex Quest universe was a shade darker, invasions and large scale war, than from where it started. Was this an intentional move or just a natural progression of the series? My intent wasn’t to make it feel darker, but I certainly wanted it to feel bigger. My thought was if it took 10+ years for a sequel to arrive, it certainly needed to feel like it was something worth waiting that long for. Plus the ZDoom source port used for CQ3 allowed textures and levels to be larger and more complicated than with the original Doom. What are your opinions on the modding community that has kept Chex Quest alive so long? What inspired you to make Chex Quest 3? The enthusiasm of the Chex Quest fans was the fuel for the development of Chex Quest 3. I was so suprised to see people putting their free time into extending an old adware game I had once worked on. One year I felt like making a 10-year anniversary gift, so I painted up a bunch of sprites for a new flemoid and released it to the community. The fans were so appreciative and excited about it that it motivated me to make more and the project quickly snowballed into a full sequel. Hypothetically, if a Kickstarter project was started to raise money towards the development of another canonical Chex Quest game would you be willing to head up the project about how much money do you think would need to be raised? Chex Quest is a brand now owned by General Mills and that means that development on a sequel would have to be iniated by them if money is involved in any way. Those concerns don’t apply to mods however, as long as they are done by hobbyists, released as freeware and are not slanderous to the brand. My online portfolio is located at www.chucktropolis.com. My most recently released title is Deadliest Warrior: Legends on XBLA and PSN. and where can they find you? My website mentioned above would be the best way to do that. I do occasionally check-in at the ChexQuest.org fan forums to see if I have messages there under my username Chukker. Lastly what game, if any, are you playing right now? I just finished Mass Effect 3 and am anxiously awaiting what this upcoming extended ending DLC has in store. Big thanks go out to Charles for this interview and for making Chex Quest 3. If you want to know more about Chex Quest visit the Forums at ChexQuest.org. There is more information there than what was touched upon in this interview. We may never see another Chex Quest game from Charles but you can bet the Chex Quest community will keep this game kicking for a long time. For that, we should all be thankful. Interesting interview. Fondly remember the first two CQ games. Didn’t even know about CQ3.